This Site is about History in Indonesia,Filipino,and other. Indonesia Proclamation Hero : Mr.Soekarno. Sukarno, born Kusno Sosrodihardjo (6 June 1901 – 21 June 1970) was the first President of Indonesia. Sukarno was the leader of his country’s struggle for independence from the Netherlands and was Indonesia’s first President from 1945 to 1967. He was replaced by one of his generals, Suharto(see Transition to the New Order), and remained under house arrest until his death. 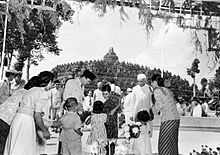 The spelling “Sukarno” is frequently used in English as it is based on the newer official spelling in Indonesia since 1947 but the older spelling Soekarno, based on Dutch orthography, is still frequently used, mainly because he signed his name in the old spelling. Official Indonesian presidential decrees from the period 1947–1968, however, printed his name using the 1947 spelling. The Soekarno–Hatta International Airport which serves near Jakarta, the capital of Indonesia for example, still uses the older spelling. Indonesians also remember him as Bung Karno or Pak Karno. Like many Javanese people, he had only one name; in religious contexts, he was occasionally referred to as “Achmed Sukarno”. The name Soekarno means “Good Karna” in Javanese. Sukarno was first exposed to nationalist ideas while living under Tjokroaminoto. Later, while a student in Bandung, he immersed himself in Western, communist, and Islamic political philosophy, eventually developing his own political ideology of Indonesian-style socialist self-sufficiency. He begin styling his ideas as Marhaenism, named after Marhaen, an Indonesian peasant he met in southern Bandung area, who owned his little plot of land and worked on it himself, producing sufficient income to support his family. In university, Sukarno began organising study club for Indonesian students, the Algemeene Studieclub, in opposition to the established student clubs dominated by Dutch students. On 4 July 1927, Sukarno with his friends from the Algemeene Studieclub established a pro-independence party, Partai Nasional Indonesia(PNI), upon which Sukarno was elected as the first leader. The party advocated independence for Indonesia, and opposed imperialism and capitalism because it opined that both systems worsened the life of Indonesian people. The party also advocated secularism and unity amongst the many different ethnicities in the Dutch East Indies, to establish a united Indonesia. Sukarno also hoped that Japan would commence a war against the western powers and that Java could then gain its independence with Japan’s aid. Coming soon after the disintegration of Sarekat Islam in early 1920s and the crushing of Partai Komunis Indonesia after their failed rebellion of 1926, PNI began to attract a large number of followers, particularly among the new university-educated youths eager for larger freedoms and opportunities denied to them in the racist and constrictive political system of Dutch colonialism. PNI activities came under the attention of the colonial government, and Sukarno’s speeches and meetings was often infiltrated and disrupted by agents of the colonial secret police (Politieke Inlichtingen Dienst/PID). Eventually, Sukarno and other key PNI leaders were arrested on 29 December 1929 by Dutch colonial authorities in a series of raids throughout Java. Sukarno himself was arrested while on a visit to Yogyakarta. On his trial at the Bandung Landraad courthouse from August to December 1930, Sukarno made a series of long political speech attacking the injustices of colonialism and imperialism, titled Indonesia Menggoegat(Indonesia Accuses). On December 1930, Sukarno was sentenced to four years in prison, which was served in Sukamiskin prison in Bandung. His impressive speech, however, received wide coverage by the press, and due to strong pressure from the liberal elements both in Netherlands and Dutch East Indies, Sukarno was released early on 31 December 1931. By this time, he had become a popular hero widely known throughout Indonesia. However, during his imprisonment, PNI had been splintered by oppression of colonial authorities and internal dissension. The original PNI was disbanded by the Dutch, and its former members formed two different parties; the Partai Indonesia (Partindo) under Sukarno’s associate Sartono who were promoting mass agitation, and the Pendidikan Nasional Indonesia (PNI Baroe) under Mohammad Hatta and Soetan Sjahrir, two nationalists who recently returned from studies in Netherlands who were promoting long-term strategy of dispensing modern education to the uneducated Indonesian populace to develop an intellectual elite able to offer effective resistance to Dutch rule. After attempting to reconcile the two parties to establish one united nationalist front, Sukarno chose to become the head of Partindo on 28 July 1932. Partindo has maintained its alignment with Sukarno’s own strategy of immediate mass agitation, and Sukarno disagreed with Hatta’s long-term cadre-based struggle. Hatta himself believed Indonesian independence will not occur within his lifetime, while Sukarno believed Hatta’s strategy to be ignorant of the fact that politics can only make real changes through formation and utilisation of force (machtsvorming en machtsaanwending). During this period, to support himself and the party financially, Sukarno re-entered architecture, opening the bureau Soekarno & Rooseno. He also wrote articles for the party’s newspaper, Fikiran Ra’jat. While being based in Bandung, Sukarno travelled extensively throughout Java to establish contacts with other nationalists. His activities attracted further attention by the Dutch PID. On mid-1933, Sukarno published a series of writings titled Mentjapai Indonesia Merdeka (“To Attain Independent Indonesia”). For this writing, he was arrested by Dutch police while visiting fellow nationalist Mohammad Hoesni Thamrin in Jakarta on 1 August 1933. This time, to prevent providing Sukarno with platform to make political speeches, the hardline governor-general jonkheer Bonifacius Cornelis de Jonge utilised his emergency powers to send Sukarno to internal exile without trial. In 1934, Sukarno was shipped, along with his family (including Inggit Garnasih), to the remote town of Ende, on the island of Flores. During his time in Flores, he utilised his limited freedom of movement to establish a children’s theatre, among its members was future politician Frans Seda. Due to an outbreak of malaria in Flores, the Dutch authorities decided to move Sukarno and his family to Bencoolen (now Bengkulu) on western coast of Sumatera, on February 1938. 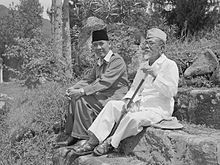 In Bengkulu, Sukarno became acquainted with Hassan Din, the local head of Muhammadiyah organisation, and he was allowed to teach Islamic religion at a local school owned by the Muhammadiyah. One of his students was 15-year old Fatmawati, daughter of Hassan Din. He became romantically involved with Fatmawati, which he justified by stating the inability of Inggit Garnasih to produce children during their almost 20-year marriage. Sukarno was still in Bengkulu exile when the Japanese invaded the archipelago in 1942. In early 1929, during the Indonesian National Revival, Sukarno and fellow Indonesian nationalist leader Mohammad Hatta (later Vice President), first foresaw a Pacific War and the opportunity that a Japanese advance on Indonesia might present for the Indonesian independence cause. In February 1942 Imperial Japan invaded the Dutch East Indies quickly defeating Dutch forces who marched, bussed and trucked Sukarno and his entourage three hundred kilometres from Bengkulu to Padang, Sumatra. They intended keeping him prisoner and shipping him to Australia, but abruptly abandoned him to save themselves upon the impending approach of Japanese forces on Padang. The Japanese had their own files on Sukarno and the Japanese commander in Sumatera approached him with respect, wanting to use him to organise and pacify the Indonesians. Sukarno on the other hand wanted to use the Japanese to free Indonesia: “The Lord be praised, God showed me the way; in that valley of the Ngarai I said: Yes, Independent Indonesia can only be achieved with Dai Nippon…For the first time in all my life, I saw myself in the mirror of Asia.” On July 1942, Sukarno was sent back to Jakarta, where he re-united with other nationalist leaders recently released by the Japanese, including Mohammad Hatta. There, he met the Japanese commander General Hitoshi Imamura, who asked Sukarno and other nationalists to galvanise support from Indonesian populace to aid Japanese war effort. Sukarno was willing to support the Japanese, in exchange for a platform for himself to spread nationalist ideas to the mass population. The Japanese, on the other hand, needed Indonesia’s manpower and natural resources to help its war effort. The Japanese recruited millions of people, particularly from Java, to be forced labor called “romusha” in Japanese. They were forced to build railways, airfields, and other facilities for the Japanese within Indonesia and as far away as Burma. Additionally, the Japanese requestioned rice and other food produced by Indonesian peasants to supply their own troops, while forcing the peasantry to cultivate castor oil plants to be used as aviation fuel and lubricants. To gain cooperation from Indonesian population and to prevent resistance to these draconian measures, the Japanese put Sukarno as head ofTiga-A mass organisation movement. On March 1943, the Japanese formed a new organisation called Poesat Tenaga Rakjat (POETERA/ Concentration of People’s Power) under Sukarno, Hatta, Ki Hadjar Dewantara, and KH Mas Mansjoer. The aim of these organisations were to galvanise popular support for recruitment of romusha forced labor, requisitioning of food products, and to promote pro-Japanese and anti-Western sentiments amongst Indonesians. Sukarno coined the term, Amerika kita setrika, Inggris kita linggis (“Let’s iron America, and bludgeon the British”) to promote anti-Allied sentiments. In later years, Sukarno was lastingly ashamed of his role with the romusha. Additionally, food requisitioning by the Japanese caused widespread famine in Java which killed more than one million people in 1944-1945. In his view, these were necessary sacrifices to be made to allow for future independence of Indonesia. He also was involved with the formation of Pembela Tanah Air (PETA) and Heiho (Indonesian volunteer army troops) via speeches broadcast on the Japanese radio and loud speaker networks across Java and Sumatera. By mid-1945 these units numbered around two million, and were preparing to defeat any Allied forces sent to re-take Java. In the meantime, Sukarno eventually divorced Inggit, who refused to accept her husband’s wish for polygamy. She was provided with a house in Bandung and a pension for the rest of her life. In 1943, he married Fatmawati. They lived in a house in Jl. Pegangsaan Timur No. 56, confiscated from its previous Dutch owners and presented to Sukarno by the Japanese. This house would later be the venue of theProclamation of Indonesian Independence in 1945. On 29 April 1945, with the fall of Philippines to American hands, the Japanese allowed for the establishment of Badan Penjelidik Oesaha-oesaha Persiapan Kemerdekaan Indonesia (BPUPKI), a quasi-legislature consisting of 67 representatives from most ethnic-groups in Indonesia. Sukarno was appointed as head of BPUPKI and was tasked to lead discussion to prepare the basis of a future Indonesian state. To provide a common and acceptable platform to unite the various squabbling factions in BPUPKI, Sukarno formulated his ideological thinking developed for the past twenty years into five principles. 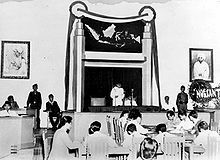 On 1 June 1945, he introduced these five principles, known as pancasila, during the joint session of BPUPKI held in the former Volksraad Building (now called Gedung Pancasila). Due to pressure from the Islamic element, the first principle mentioned the obligation for Muslims to practice Islamic law (sharia). However, the final Sila as contained in the 1945 Constitution which was put into effect on 18 August 1945, excluded the reference to Islamic law for sake of national unity. The elimination of sharia was done by Mohammad Hatta based upon request by Christian representative Alexander Andries Maramis, and after consultation with moderate Islamic representatives Teuku Mohammad Hassan, Kasman Singodimedjo, and Ki Bagoes Hadikoesoemo. On 7 August 1945, the Japanese allowed the formation a smaller Panitia Penjelidik Kemerdekaan Indonesia (PPKI), a 21-person committee tasked with creating specific governmental structure of future Indonesian state. On 9 August, the top leaders of PPKI (Sukarno, Hatta, and KRH Radjiman Wediodiningrat), were summoned by Commander-in-Chief of Japan’s Southern Expeditionary Forces, Field Marshal Hisaichi Terauchi, to Da Lat, 100 km from Saigon. Field Marshal Terauchi gave Sukarno the freedom to proceed with preparation for Indonesian independence, free of Japanese interference. After much wining and dining, Sukarno’s entourage was flown back to Jakarta on 14 August. Unbeknownst to the guests, atomic bombs had been dropped on Hiroshima and Nagasaki, and the Japanese were preparing for surrender. The following day, on 15 August, the Japanese declared their acceptance of Potsdam Declaration terms, and unconditionally surrendered to the Allies. On the afternoon of that day, Sukarno received this information from leaders of youth groups and members of PETA Chairul Saleh, Soekarni, and Wikana, who had been listening to Western radio broadcasts. They urged Sukarno to declare Indonesian independence immediately, while the Japanese were in confusion and before the arrival of Allied forces. Faced with this quick turn of events, Sukarno procrastinated. He feared bloodbath due to hostile response from the Japanese to such a move, and was concerned with prospects of future Allied retribution. At early morning on 16 August, the three youth leaders, impatient with Sukarno’s indecision, kidnapped him from his house and brought him to a small house in Rengasdengklok, Karawang, owned by a Chinese family and occupied by PETA . There they gained Sukarno’s commitment to declare independence within the next day. That night, the youths drove Sukarno back to the house of Admiral Tadashi Maeda, the Japanese naval liaison officer in Menteng area of Jakarta, who sympathised with Indonesian independence. There, he and his assistant Sajoeti Melik prepared text of Proclamation of Indonesian Independence. On early morning of 17 August 1945, Sukarno returned to his house at Jl Pegangsaan Timur No. 56, where he was joined by Mohammad Hatta. Throughout the morning, impromptu leaflets printed by PETA and youth elements informed the population of the impending proclamation. Finally, on 10 am, Sukarno and Hatta stepped to the front porch, where Sukarno declared the independence of the Republic of Indonesia in front of a crowd of 500 people. Appointing Sukarno and Mohammad Hatta as President and Vice-President and their cabinet. Putting into effect the 1945 Indonesian constitution, which by this time excluded any reference to Islamic law. Setting a Central Indonesian National Committee (Komite Nasional Indonesia Poesat/KNIP) to assist the president prior to election of a parliament. Sukarno argued that all of the principles of the nation could be summarized in the phrase gotong royong. The Indonesian parliament, founded on the basis of this original (and subsequently revised) constitution, proved all but ungovernable. This was due to irreconcilable differences between various social, political, religious and ethnic factions. In the days following the Proclamation, the news of Indonesian independence was spread by radio, newspaper, leaflets, and word of mouth despite attempts by the Japanese soldiers to suppress the news. On 19 September, Sukarno addressed a crowd of one million people at the Ikada Field of Jakarta (now part of Merdeka Square) to commemorate one month of independence, indicating the strong level of popular support for the new republic, at least on Java and Sumatera. In these two islands, the Sukarno government quickly established governmental control while the remaining Japanese mostly retreated to their barracks awaiting arrival of Allied forces. This period was marked by constant attacks by armed groups on Europeans, Chinese, Christians, native aristocracy and anyone who were perceived to oppose Indonesian independence. The most serious cases were the Social Revolutions in Aceh and North Sumatera, where large numbers of Acehnese and Malay aristocrats were killed by Islamic groups (in Aceh) and communist-led mobs (in North Sumatera), and the “Three Regions Affair” in northwestern coast of Central Java where large numbers of Europeans, Chinese, and native aristocrats were butchered by mobs. These bloody incidences continued until late 1945 to early 1946, and begin to peter-out as Republican authority begin to exert and consolidate its control. Sukarno’s government initially postponed the formation of a national army, for fear of antagonizing the Allied occupation forces and their doubt over whether they would have been able to form an adequate military apparatus to maintain control of seized territory. The members of variousmilitia groups formed during Japanese occupation such as the disbanded PETA and Heiho, at that time were encouraged to join the BKR—Badan Keamanan Rakjat (The People’s Security Organization)—itself a subordinate of the “War Victims Assistance Organization”. It was only in October 1945 that the BKR was reformed into the TKR—Tentara Keamanan Rakjat (The People’s Security Army) in response to the increasing Allied and Dutch presence in Indonesia. The TKR armed themselves mostly by attacking Japanese troops and confiscating their weapons. Due to sudden transfer of Java and Sumatera from General Douglas MacArthur‘s American-dominated Southwest Pacific Area to Lord Louis Mountbatten‘s British-dominated Southeast Asian Command, the first Allied soldiers (1st Battalion of Seaforth Highlanders) only arrived in Jakarta on late September 1945. British forces began to occupy major Indonesian cities on October 1945. The commander of British 23rd Division, Lieutenant General Sir Philip Christison, set-up command in the former governor-general’s palace in Jakarta. Christison stated its intentions as the liberation of all Allied prisoners-of-war, and to allow the return of Indonesia to its pre-war status, as colony of Netherlands. The Republican government were willing to cooperate with regards to the release and repatriation of Allied civilian and military POWs, setting-up the Committee for the Repatriation of Japanese and Allied Prisoners of Wars and Internees (Panitia Oeroesan Pengangkoetan Djepang dan APWI/POPDA) for this purpose. POPDA, in cooperation with the British, repatriated more than 70,000 Japanese and Allied POWs and internees by the end of 1946. To resist Dutch attempts to regain control of the country, Sukarno’s strategy was to seek international recognition and support for the new Indonesian Republic, in view of the relative military weakness of the Republic compared with British and Dutch military power. Sukarno was aware that his past history as Japanese collaborator might complicate relationship with the Western countries. Hence, to help acquire international recognition as well as to accommodate domestic demands for establishment of political parties, Sukarno allowed the formation of parliamentary system of government, whereby a prime minister controlled day-to-day affairs of the government, while Sukarno as president remained as figurehead. The prime minister and his cabinet will be responsible to the Central Indonesian National Committeeinstead of the president. On 14 November 1945, Sukarno appointed Sutan Sjahrir as first prime minister, he was a European-educated politician who was never involved with the Japanese occupation authorities. Ominously, Dutch soldiers and administrators under the name of Netherlands Indies Civil Administration (NICA) began to return under the protection of the British. They were led by Hubertus Johannes van Mook, a pre-war Dutch colonial administrator who led the Dutch East Indies government-in-exile in Brisbane, Australia. They armed released Dutch POWs, which began to engage in shooting rampages against Indonesian civilians and Republican police. As consequence, armed conflict soon erupted between the newly-constituted Republican forces aided by a myriad of pro-independence mob groups, against the British and Dutch forces. On 10 November, a full-scale battle broke-out inSurabaya between British Indian 49th Infantry Brigade and Indonesian population, involving air and naval bombardments of the city by the British. 300 British soldiers were killed (including its commander Brigadier AWS Mallaby), while thousands of Indonesians died. Shootouts broke-out with alarming regularity in Jakarta, including an attempted assassination of Prime Minister Sjahrir by Dutch gunmen. To avoid this menace, Sukarno and majority of his government left for the safety of Yogyakarta on 4 January 1946. There, the Republican government received protection and full support from Sultan Hamengkubuwono IX. Yogyakarta will remain as the Republic’s capital until end of the war in 1949. Sjahrir remained in Jakarta to conduct negotiations with the British. The initial series of battles in late 1945 and early 1946 left the British in control of major port cities on Java and Sumatera. During the Japanese occupation, the Outer Islands (excluding Java and Sumatera) was occupied by Japanese Navy (Kaigun), which did not allow for political mobilisation in their areas on account of the small population base available for mobilisation, and the proximity of these areas to active theatres of war. Consequently, there were little Republican activity in these islands post-proclamation. Australian and Dutch forces quickly occupied these islands without much fighting by end of 1945 (excluding the resistance of I Gusti Ngurah Rai in Bali, the insurgency inSouth Sulawesi, and fighting in Hulu Sungai area of South Kalimantan). Meanwhile, the hinterland areas of Java and Sumatera remained under Republican administration. Eager to pull-out its soldiers from Indonesia, the British allowed for large-scale infusion of Dutch forces into the country throughout 1946. By November 1946, all British soldiers have been withdrawn from Indonesia, replaced by more than 150,000 Dutch soldiers. On the other hand, the British sent Lord Archibald Clark Kerr, 1st Baron Inverchapel and Miles Lampson, 1st Baron Killearn to bring the Dutch and Indonesians to the negotiating table. The result of these negotiations was the Linggadjati Agreement signed on November 1946, where the Dutch acknowledged de facto Republican sovereignty over Java, Sumatera, and Madura. In exchange, the Republicans were willing to discuss future Commonwealth-like United Kingdom of Netherlands and Indonesia. Sukarno’s decision to negotiate with the Dutch was met with strong opposition by various Indonesian factions. Tan Malaka, a communist politician, organised these groups into a united front called the Persatoean Perdjoangan (PP). PP offered a “Minimum Program” which called for complete independence, nationalisation of all foreign properties, and rejection of all negotiations until all foreign troops are withdrawn. These programmes received widespread popular support, including from armed forces commander General Sudirman. On 4 July 1946, military units linked with PP kidnapped Prime Minister Sjahrir who was visiting Yogyakarta. Sjahrir was leading the negotiation with the Dutch. Sukarno, after successfully influencing Sudirman, managed to secure the release of Sjahrir and the arrest of Tan Malaka and other PP leaders. Disapproval of Linggadjati terms within the KNIP led Sukarno to issue a decree doubling KNIP membership by including many pro-agreement appointed members. As consequence, KNIP ratified the Linggadjati Agreement on March 1947. On 21 July 1947, the Linggadjati Agreement was broken by the Dutch, who launched Operatie Product, a massive military invasion into Republican-held territories. Although the newly-reconsitituted TNI was unable to offer significant military resistance, the blatant violation by the Dutch on internationally-brokered agreement outraged world opinion. International pressure forced the Dutch to halt their invasion force on August 1947. Sjahrir, who has been replaced as prime minister by Amir Sjarifuddin, flew to New York City to appeal Indonesian case in front of United Nations. UN Security Council issued a resolution calling for immediate ceasefire, and appointed a Good Offices Committee (GOC) to oversee the ceasefire. The GOC, based in Jakarta, consisted of delegations from Australia (led by Richard Kirby, chosen by Indonesia), Belgium (led by Paul van Zeeland, chosen by Netherlands), and United States (led by Frank Porter Graham, neutral). The Republic was now under strong Dutch military stranglehold, with the Dutch military occupying West Java, and the northern coast ofCentral Java and East Java, along with the key productive areas of Sumatera. Additionally, the Dutch navy blockaded Republican areas from supplies of vital food, medicine, and weapons. As consequence, Prime Minister Amir Sjarifuddin has little choice but to sign the Renville Agreement on 17 January 1948, which acknowledged Dutch control over areas taken during Operatie Product, while the Republicans pledged to withdraw all forces that remained on the other side of the ceasefire line (“Van Mook Line“). Meanwhile, the Dutch begin to organize puppet states in the areas under their occupation, to counter Republican influence utilising ethnic diversity of Indonesia. The signing of highly disadvantageous Renville Agreement caused even greater instability within the Republican political structure. In Dutch-occupied West Java, Darul Islam guerrillas under Sekarmadji Maridjan Kartosuwirjo maintained their anti-Dutch resistance and repealed any loyalty to the Republic, they will cause a bloody insurgency in West Java and other areas in the first decades of independence. Prime Minister Sjarifuddin, who signed the agreement, was forced to resign on January 1948, and was replaced by Mohammad Hatta. Hatta cabinet’s policy of rationalising the armed forces by demobilising large numbers of armed groups that proliferated the Republican areas, also caused severe disaffection. Leftist political elements, led by resurgent Indonesian Communist Party (PKI) under Musso took advantage of public disaffections by launching rebellion in Madiun, East Java, on 18 September 1948. Bloody fighting continued during late-September until end of October 1948, when the last communist bands were defeated and Musso shot dead. The communists have overestimated their potential to oppose the strong appeal of Sukarno amongst the population. Sukarno and Foreign Minister Agus Salimin Dutch custody, 1949. On 19 December 1948, to take advantage of the Republic’s weak position following the communist rebellion, the Dutch launched Operatie Kraai, a second military invasion designed to crush the Republic once and for all. The invasion was initiated with an airborne assault on Republican capitalYogyakarta. Sukarno ordered the armed forces under Sudirman to launch guerilla campaign in the countryside, while he and other key leaders such as Hatta and Sjahrir allowed themselves to be taken prisoner by the Dutch. To ensure continuity of government, Sukarno sent a telegram toSjafruddin Prawiranegara, providing him the mandate to lead an Emergency Government of the Republic of Indonesia (PDRI), based on the unoccupied hinterlands of West Sumatera, a position he kept until Sukarno was released on June 1949. The Dutch sent Sukarno and other captured Republican leaders to captivity in Prapat, in Dutch-occupied part of North Sumatera and later to the island of Bangka. The second Dutch invasion caused even more international outrage. United States, impressed by Indonesia’s ability to defeat the 1948 communist challenge without outside help, threatened to cut-off Marshall Aid funds to Netherlands if military operations in Indonesia continued. TNI did not disintegrate and continued to wage guerilla resistance against the Dutch, most notably the assault on Dutch-held Yogyakarta led by Lieutenant-Colonel Suharto on 1 March 1949. Consequently, the Dutch were forced to sign the Roem-van Roijen Agreement on 7 May 1949. According to this treaty, the Dutch released the Republican leadership and returned the area surroundingYogyakarta to Republican control on June 1949. This is followed by the Dutch-Indonesian Round Table Conference held in The Hague which led to the complete transfer of sovereignty by the Queen Juliana of the Netherlands to Indonesia, on 27 December 1949. On that day, Sukarno flew from Yogyakarta to Jakarta, making a triumphant speech at the steps of the governor-general’s palace, immediately renamed the Merdeka Palace (“Independence Palace”). On March 1960, Sukarno disbanded parliament and replaced it with a new parliament where half the members were appointed by the president (Dewan Perwakilan Rakjat – Gotong Rojong / DPR-GR). On September 1960, he established a Provisional People’s Consultative Assembly (Madjelis Permusjawaratan Rakjat Sementara/MPRS) as the highest legislative authority according to the 1945 constitution. MPRS members consisted of members of DPR-GR and members of “functional groups” appointed by the president. With the backing of the military, Sukarno disbanded the Islamic party Masyumi and Sutan Sjahrir‘s party PSI, accusing them of involvement with PRRI-Permesta affair. The military arrested and imprisoned many of Sukarno’s political opponents, from socialist Sjahrir to Islamic politiciansMohammad Natsir and Hamka. Using martial law powers, the government closed-down newspapers who were critical of Sukarno’s policies. During this period, there were several assassination attempts on Sukarno’s life. On 9 March 1960, Daniel Maukar, an Indonesian airforce lieutenant who sympathised with the Permesta rebellion, strafed the Merdeka Palace and Bogor Palace with his MiG-17 fighter jet, attempting to kill the president; he was not injured. On May 1962, Darul Islam agents shot at the president during Eid al-Adha prayers on the grounds of the palace. Sukarno again escaped injury. On the security front, the military started a series of effective campaigns which ended the long-festering Darul Islam rebellion in West Java (1962), Aceh (1962), and South Sulawesi (1965). Kartosuwirjo, the leader of Darul Islam, was captured and executed in September 1962. To counter-balance the power of the military, Sukarno started to rely on the support of the Communist Party of Indonesia (PKI). In 1960, he declared his government to be based on Nasakom, a union of the three ideological strands present in Indonesian society: nasionalisme(nationalism), agama (religions), and komunisme (communism). Accordingly, Sukarno started admitting more communists into his government, while developing strong relationship with the PKI chairman Dipa Nusantara Aidit. In order to increase Indonesia’s prestige, Sukarno supported and won the bid for the 1962 Asian Games held in Jakarta. Many sporting facilities such as the Senayan sports complex (including the 100,000-seat Bung Karno Stadium) were built to accommodate the games. There was political tension when the Indonesians refused the entry of delegations from Israel and Taiwan. After the International Olympic Committee put sanctions on Indonesia due to this exclusion policy, Sukarno retaliated by organising a “non-imperialist” competitor event to the Olympic Games, called Games of New Emerging Forces (GANEFO). GANEFO was successfully held in Jakarta on November 1963, and was attended by 2,700 athletes from 51 countries. As part of his prestige-building program, Sukarno ordered the construction of large monumental buildings such as National Monument (Monumen Nasional), Istiqlal Mosque, CONEFO Building (now the Parliament Building), Hotel Indonesia, and the Sarinah shopping centre to transform Jakarta from a former colonial backwater to a modern city. The modern Jakarta boulevards of Jalan Thamrin, Jalan Sudirman, and Jalan Gatot Subroto was planned and constructed under Sukarno. As Sukarno’s domestic grip on power was secured, he began to pay more attention to the world stage, where Sukarno embarked on a series of aggressive and assertive policies based on anti-imperialism to increase Indonesia’s prestige internationally. These anti-imperialist and anti-Western policies, often bordering on brinkmanship, were also designed to provide a common cause to unite the diverse and fractious Indonesian people. In this, he was aided by his Foreign Minister Subandrio. Since his first visit to Beijing in 1956, Sukarno has began in the 1950s to increase his ties to the People’s Republic of China and the communist bloc in general. He also began to accept increasing amounts of Soviet bloc military aid. By early 1960s, Soviet bloc provided more aid to Indonesia than to any other non-communist country, while Soviet military aid to Indonesia was only equalled by aid provided to Cuba. This large influx of communist aid prompted an increase in military aid from the Dwight Eisenhower and John F. Kennedyadministrations, which worried about a leftward drift should Sukarno rely too much on Soviet bloc aid. Sukarno was feted during his visit to United States in 1956, where he addressed a joint session of United States Congress. Soon after his first visit to America, Sukarno visited Soviet Union, where he received even more lavish welcome to Moscow. Soviet Premier Nikita Khrushchev paid a return visit to Jakarta and Bali in 1960, where Khrushchev awarded Sukarno with the Lenin Peace Prize. To make amends for the CIA involvement in the PRRI-Permesta rebellion, President Kennedy invited Sukarno to Washington, and provided Indonesia with billions of dollars in civilian and military aid. Despite his close relationships with both Western and Communist Blocs, Sukarno increasingly attempted to forge a new alliance called the “New Emerging Forces”, as a counter to the old superpowers, whom he accused of spreading “Neo-Colonialism and Imperialism” (NEKOLIM). 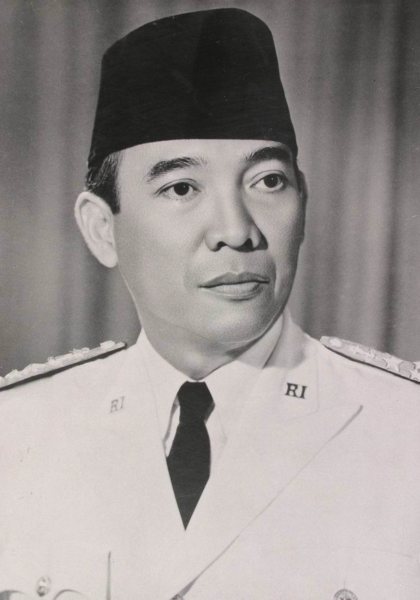 In 1961, this first president of Indonesia also found another political alliance, an organization, called the Non-Aligned Movement(NAM, in Indonesia known as Gerakan Non-Blok, GNB) with Egypt’s President Gamal Abdel Nasser, India’s Prime Minister Pandit Jawaharlal Nehru, Yugoslavia‘s President Josip Broz Tito, and Ghana’s President Kwame Nkrumah, in an action called The Initiative of Five (Sukarno, Nkrumah, Nasser, Tito, and Nehru). This action was a movement to not give any favour to the two superpower blocs, who were involved in theCold War. Sukarno is still fondly remembered for his role in promoting the influence of newly-independent countries; among others, his name is used as streetnames in Cairo, Egypt and Rabat, Morocco, and as a major square in Peshawar, Pakistan. In 1956, the University of Belgrade awarded him an honorary doctorate. As the NAM countries were becoming split into differing factions, and as fewer countries were willing to support Sukarno’s growing aggressive anti-Western foreign policies, he increasingly began to abandon his non-alignment rhetoric, in exchange for a new alliance with China, North Korea, North Vietnam, and Cambodia, an alliance he called the “Beijing–Pyongyang–Hanoi–Phnom Penh–Jakarta Axis”. After withdrawing Indonesia from the “imperialist-dominated” United Nationson January 1965, Sukarno sought to establish a competitor organisation to the UN called Conference of New Emerging Forces (CONEFO) with support from China, who at that time was not yet a member of United Nations. Sukarno began an aggressive foreign policy to secure Indonesian territorial claims. On August 1960, Sukarno broke-off diplomatic relations with the Netherlands over continuing failure to commence talks on the future of Netherlands New Guinea, as was agreed at the Dutch-Indonesian Round Table Conference of 1949. After the Dutch announced the formation of a Nieuw Guinea Raad on April 1961, with the intention of creating an independent Papuan state, Sukarno declared military confrontation in his Tri Komando Rakjat (TRIKORA) speech in Yogyakarta, on 19 December 1961. He organised military incursions into the half-island, whom he referred to as West Irian, which by end of 1962 has landed around 3,000 Indonesian soldiers throughout West Irian. On January 1962, a naval battle erupted when an Indonesian infiltration fleet of four torpedo boats were intercepted by Dutch ships and planes off the coast of Vlakke Hoek. In this battle, one Indonesian boat was sunk, killing the Naval Deputy Chief-of-Staff Commodore Jos Sudarso. On February 1962, the Kennedy administration, worried of a continuing Indonesian shift towards communism should the Dutch held-on to West Papua, sent Attorney-General Robert Kennedy to Netherlands, to underline that United States will not support Netherlands in case of conflict with Indonesia. With massive Soviet armaments and even manpower aid, Sukarno planned a large-scale air and seaborne invasion on the Dutch military headquarters of Biak scheduled for August 1962, called Operasi Djajawidjaja, to be led by Major-GeneralSuharto. Before these highly risky plans can be realised, Indonesia and Netherlands signed the New York Agreement on August 1962. The two countries agreed to implement the Bunker Plan (formulated by American diplomat Ellsworth Bunker), whereby the Dutch agreed to hand-over West Papua to UNTEA on 1 October 1962. UNTEA handed the territory to Indonesian authority on May 1963. After securing control over West Irian, Sukarno also opposed the British-supported establishment of Federation of Malaysia in 1963, claiming that it was a neo-colonial plot by the British to besiege Indonesia. In spite of his political overtures, which was partly justified when some leftist political elements in British Borneo territories Sarawak and Brunei opposed the Federation plan and aligned themselves with Sukarno, Malaysia was proclaimed in September 1963. This led to the Indonesia–Malaysia confrontation (Konfrontasi), proclaimed by Sukarno in hisDwi Komando Rakjat (DWIKORA) speech in Jakarta on 3 May 1964. Sukarno’s proclaimed objective was not to annex Sabah and Sarawakinto Indonesia, but to establish a State of North Kalimantan under the control of North Kalimantan Communist Party. From 1964 until early 1966, limited numbers of Indonesian soldiers, “volunteers”, and Malaysian communist guerillas were infiltrated into both north Borneo and the Malay Peninsula, where they engaged in jungle warfare with British and Commonwealth soldiers deployed to protect the nascent Malaysia. Indonesian agents also exploded several bombs in Singapore. Domestically, Sukarno whipped up anti-British sentiment and the British Embassy was burned down. In 1964, all British companies operating in the country, including Indonesian operations of the Chartered Bankand Unilever, were nationalized. By 1964, Sukarno commenced an anti-American campaign due to his growing shift towards the communist bloc, and less friendly Lyndon Johnson administration. American interests and businesses in Indonesia denounced and even attacked by PKI-led mobs. American movies were banned, American books and records of the Beatles were burned, and Indonesian band Koes Plus was jailed for playing American-stylerock and roll music. As a result, US aid to Indonesia was halted, to which Sukarno made his famous remark, “Go to hell with your aid”. Sukarno withdrew Indonesia from the United Nations membership on 7 January 1965 when, with US backing, Malaysia took a seat of UN Security Council. By this time, Sukarno’s brinkmanship policies left him with few international allies. With the government already severely indebted to the tune of US$ 1 billion to the Soviet Union, Sukarno became increasingly dependent to Communist China for support. He spoke increasingly of a Peking-Jakarta axis, which will be the core of a new anti-imperialist world organization, the CONEFO. Sukarno married Siti Oetari in 1920, and divorced her in 1923 to marry Inggit Garnasih, whom he divorced circa 1943 to marry Fatmawati.Sukarno also married Hartini in 1954, after which he and Fatmawati separated without divorcing. In 1959 he married a third wife, the then 19-year old Japanese hostess Naoko Nemoto (renamed Dewi Sukarno). In the early 1960s, Sukarno went on to marry 4 more wives: Kartini Manoppo; Yurike Sanger; Heldy Djafar; Amelia de la Rama. On 22 June 1966, Sukarno made the Nawaksara speech in front of MPRS session, an unsuccessful last-ditch attempt to defend himself and his guided democracy system. On August 1966, over Sukarno’s objections, Indonesia ended its confrontation with Malaysia and rejoined theUnited Nations. After making another unsuccessful accountability speech (Nawaksara Addendum) on 10 January 1967, Sukarno was stripped of his presidential title by MPRS on 12 March 1967, in a session chaired by his former ally, Nasution. He was put under house arrest in Bogor Palace, where his health deteriorated due to denial of adequate medical care. He died of kidney failure in Jakarta Army Hospital on 21 June 1970 at age 69. He was buried in Blitar, East Java, Indonesia. In recent decades, his grave has been a significant venue in the network of places that Javanese visit on ziarah and for some is of equal significance to those of the Wali Songo.